Transport secretary Chris Grayling has launched an independent review to ‘ensure the affordability of Crossrail 2’, while pledging that a £3bn upgrade programme on TransPennine rail routes would start next spring. Mr Grayling reaffirmed the Government’s commitment to ensuring that transport improvements across the country advance ‘in lockstep’. 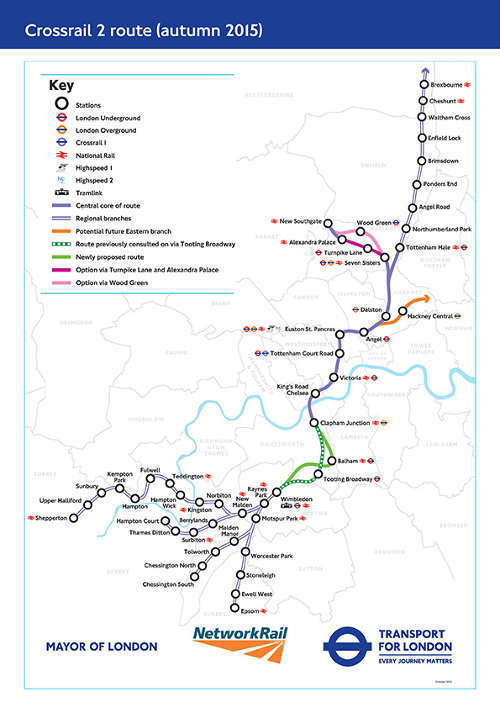 The Department for Transport called the Independent Affordability Review into Crossrail 2, commissioned jointly with Transport for London, ‘an important step in developing the project’. It will ensure that the project learns from the best practice exhibited by projects like Crossrail, and that those who stand to benefit from new infrastructure contribute to funding it. It is expected to conclude this summer. Mike Gerrard, former managing director of Thames Tideway Tunnel, will lead the review ‘ensuring the public gets an affordable scheme that is fair to the UK taxpayer’. He said: ‘Crossrail 2 has the potential to relieve congestion and unlock housing, jobs and development to support future growth in London, but it is imperative that it can be delivered in an affordable way that is fair to both the London public and the wider UK taxpayer. London’s transport commissioner, Mike Brown, said: ‘We welcome the Government’s backing for infrastructure projects of national importance such as Crossrail 2 and are pleased to be working with the Department for Transport on the Independent Affordability Review. London mayor Sadiq Khan said: 'I’m pleased that the Government has reaffirmed its commitment to Crossrail 2 and am happy to endorse Mike Gerrard as the chair of the Independent Affordability Review. There’s no doubt that this project is essential for the future prosperity of London, the South East andour country so it’s vital we continue to progress with it. Referring to Network Rail’s plann to spend £3.1bn on improvements to the TransPennine Route from 2019-24, first reported by Transport Network, Mr Grayling said: ‘I want to realise passenger benefits from the £3bn we have ring-fenced for the Pennine route as fast as possible. ‘Network Rail has already begun detailed designs, and provided us with options for the TransPennine Route Upgrade to meet the objectives we’ve set out - for journey times, capacity and reliability. He added that he will work with local authorities along the TransPennine route to discuss how to maximise the benefits of the spending, such as creating new stations to increase access to the railway and finding opportunities for housing development. Mr Grayling also thanked rail and road workers for their dedication to keeping the country moving in the snowy conditions.